Former Republican Nominee Mitt Romney Calls Donald Trump 'A Phony, A Fraud' In an unprecedentedly critical speech, Romney blasted almost every aspect of Trump's career and personality. Returning fire on Thursday, Trump again called Romney a "choke artist." 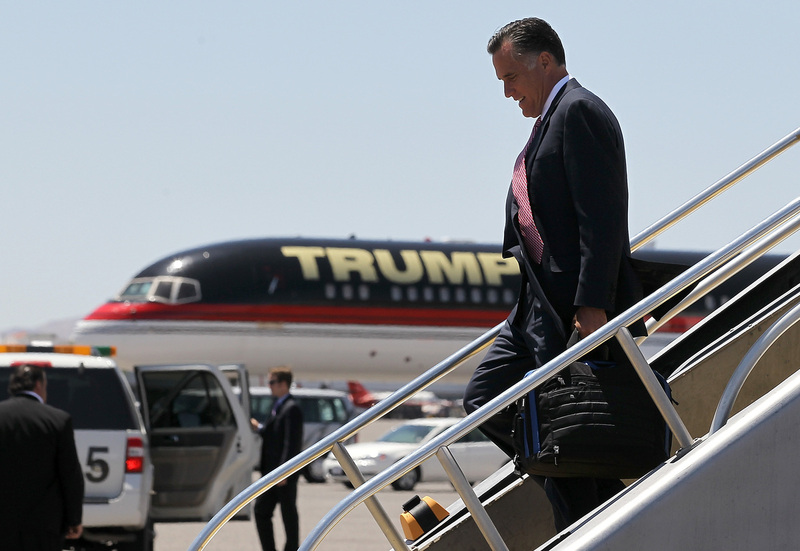 Former Republican presidential candidate Mitt Romney walks off his campaign plane past Donald Trump's plane in Las Vegas in 2012. Romney described Trump as "a con artist" whose demeanor is "recklessness in the extreme." As for Trump's record as a "huge business success"? "No, he isn't." And when it comes to Trump's prescriptions to bring back jobs from China and Japan? "Flimsy at best." Trump quickly hit back at Romney during a rally Thursday afternoon, again calling him a "choke artist" and saying he was disappointed by his 2012 campaign. "The guy ran one of the worst campaigns in the history of politics," Trump said. Trump added that Romney "chickened out" from running in 2016 because of Trump's candidacy. Romney spoke for 20 minutes at the Hinckley Institute at the University of Utah and got specific, digging into aspects of Trump's record as a businessman. "His promises are as worthless as a degree from Trump University. He's playing the American public for suckers: He gets a free ride to the White House and all we get is a lousy hat," Romney said, referring to a real estate seminar Trump launched in 2005 that was forced to change its name because it wasn't a real university. It is now the subject of multiple lawsuits alleging fraudulent behavior. Romney then added to the list of failed business ventures: "There's Trump Magazine and Trump Vodka and Trump Steaks, and Trump Mortgage?" Romney concluded, "A business genius he is not." Then came the attacks on Trump as a human being. "After all, this is an individual who mocked a disabled reporter, who attributed a reporter's questions to her menstrual cycle, who mocked a brilliant rival who happened to be a woman due to her appearance, who bragged about his marital affairs, and who laces his public speeches with vulgarity." Romney remarks are unprecedented in the way he — the party's most recent presidential nominee — attacks the man who seems on track to secure this year's GOP nomination. Romney began the speech by saying he is not declaring his own candidacy, adding, "I am not going to endorse a candidate today." He said one of three others still in the race — Sens. Ted Cruz or Marco Rubio, or Gov. John Kasich — should be the nominee. Then, without saying so specifically, he seemed to endorse a strategy to bring about a brokered GOP convention this summer. "Given the current delegate selection process, this means that I would vote for Marco Rubio in Florida, for John Kasich in Ohio, and for Ted Cruz or whichever one of the other two contenders has the best chance of beating Mr. Trump in a given state," said Romney. The goal would be to deny Trump the 1,237 delegates he needs to win the nomination on the convention's first ballot in July. After reports surfaced that Romney was planning to speak out against Trump on Thursday, the billionaire was quick to fire back at Romney on Twitter. Will Romney's blunt words have any impact? It's not likely Trump supporters will be moved by the critique of a man they see as the ultimate establishment insider — who failed in attempts to win the presidency. In the past year, Trump has hardly needed excuses to lay into Romney. In stump speeches, he regularly calls Romney a "loser" who blew the chance to defeat President Obama in 2012. In an interview Thursday morning with the Today show, Trump called Romney a "stiff." But it wasn't always so contentious between these two wealthy Republican businessmen. Trump endorsed Romney's 2012 White House bid, and Romney eagerly reciprocated the love. "I spent my life in the private sector — not quite as successful as this guy," Romney said at the time, turning and gesturing toward a gushing Trump. "But successful nonetheless." Romney has been critical of Trump's tone for months, but this speech comes as Trump has won 10 of the first 15 nominating contests, holds a lead in convention delegates and shows little sign of flagging. While many Republican insiders are eager to rally around a non-Trump candidate, there's no indication voters are consolidating around an alternative. In addition to criticizing his temperament, Romney argued that Trump is unelectable in a general election. "Trump relishes any poll that reflects what he thinks of himself. But polls are also saying that he will lose to Hillary Clinton," said Romney. This week, a group of more than 60 conservative foreign policy experts wrote an open letter denouncing Trump's statements, concluding that Trump is "fundamentally dishonest" and would "use the authority of his office to act in ways that make America less safe, and which would diminish our standing in the world."